Simon Leung, based primarily in Los Angeles, contributes an archival photograph printed at life size, depicting a number of detained communist sympathizers in the 1967 conflicts in Hong Kong squatting in a stairwell. This “Proposal for Squatting Project/ Hong Kong” (2010) continues a longstanding series for the artist, evaluating the structural possibilities of the body as architecture by inserting these absent subjects from the past into the exhibition space. Behind this wall, a video by the artist entitled “Time Museum Time” (2010) loops for just under an hour, documenting his personal experience showing in the Guangzhou Triennial as hired manual laborers install the work to be exhibited in the Time Museum, a venue designed by Rem Koolhaas and located across several stories of a private residential complex. Projected, like the photograph of “Proposal,” at life size, the speed of the video is often artificially distorted, pitting the pure physical power of these squatting workers against the ahistorical and generic aesthetics of the museum and drawing attention to these architectures of the body, bent out of sheer exhaustion. In what must be the strongest work in the exhibition, another room is given over to Leung’s “POE” (2007), a single-channel video drawing from a range of materials including the life of Edgar Allen Poe and the forces of gentrification that threaten his historical legacy, the writing of Robert Smithson and his site/ non-site dialectic, the choreography of Yvonne Rainer, and the figure of the green screen as an interpretation of the Green Zone in Baghdad. The overall impression is that of the rather forced construction of a narrative of the contemporary moment through the evidence, so to speak, of ideas and figures existing only in a more immaterial state. Sreshta Rit Premnath, based in New York, narrates the construction of otherness through complexity itself. In “Horizon” (2010), the artist collects photographs of monuments to Christopher Columbus from various anonymous sources, utilizing cloning tools to digitally manipulate the images such that the statues themselves disappear, leaving only the plinths, frames, and memorial texts beneath. The project speaks to a certain politics of remembering in its reminder of the fear of forgetting, but the choice of such an ambiguous historical figure also pushes the question of the criteria for such memorial practices. This sense of the deserving anti-monument prevents the images from functioning purely as examinations of the mechanisms of the monument: ornamentation, inscription, location, and so on. To one side, a seemingly nonsensical phrase, “we learned that what we thought was land was only the sky,” is given the treatment of monumental legacy, toying with the context and purpose of such memorial projects through ambiguity; the inscription is actually an excerpt from the journals of Christopher Columbus. 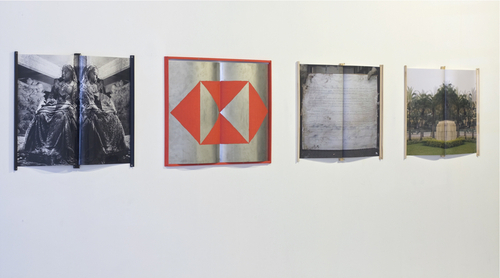 In another piece, entitled “Ekphrasis” (2010), a series of images are reproduced on folded broadsheet in wooden frames, the nebulous content including a statue of Queen Victoria juxtaposed with an image of the monarch in the flesh, an abstraction of the HSBC logo, a marble slab, and a blurred pedestal. Taken together, these figures reflect or perhaps deflect the folds and detours of narrative either historical or remembered, gathering evidence from the World War II destruction of the monuments in Hong Kong’s Statue Square–where today only a single statue, that of a founding banker at HSBC, remains standing. Lin + Lam, a collective project by Lama Lin and H. Lan Thao Lam, typically work through the collection of interviews, objects, and archives in an effort to interrogate national identity and historical memory. In “Even the Trees Would Leave” (2005), framed photographs and embossed text relate the conversion of former Vietnamese refugee camps in Hong Kong. Able to be conjured for the spectator only through the spectacle of their disappearance, these sites of trauma and cultural quarantine, including the largest at Whitehead, have been converted to driving ranges and golf courses. “Tomorrow I Leave” (2010) includes a video component that superimposes letters between family members as an absent member revisits the former refugee camps in which she resided over tranquil images of the sea and islands. Here again the question of adaptive reuse emerges, as one side of a given camp area is preserved as a natural marine park while the other has become a parking lot for recreation facilities of some kind. In both of these cases an often unendurable history has been replaced with harmless sites of entertainment, aiding the work of forgetting in an ambiguous way and making it necessary to trace even this cartography of personal presence through spectral ambitions. “Tomorrow I Leave” also includes a number of assemblages of postcards and objects mailed from visits to former refugee camps in Malaysia, accumulating an aura of the talismanic that may be opposed to the purely documentary impulse of most historical investigation. The whimsical arrangement of these objects, however, takes away from the gravity of their haunting power on some level. Key to this idea of the “creation of narratives-in-reverse” through affective recognition is the concept of research-based art practice, something present in spades in this exhibition but sorely lacking in most art practice across both Hong Kong and China. While attempts at “experimental art” at the Central Academy of Fine Arts in Beijing and “total art” at the China Academy in Hangzhou have made steps toward such methods, these educational programs are restricted by a lack of willingness to transform the results of any rigorous research practice into a form of art other than the purely documentary. Partially because research-based practice is so well-suited to ideas of spectral narratives but also because of the developmental trajectories of international art within which Leung, Premnath, and Lin + Lam exhibit, this particular project pulls off a heartening investigation of alternative voices for subaltern subject positions in diasporic networks of residual violence. Apart from such political goals, the work presented here also gestures towards a future for socially engaged art after the dead-end of the relational aesthetics birthed by the politics of identity, transitioning towards a self-sufficient system of relationships between objects and a critique of the ideological rules and systems contained therein. Hong Kong deserves such curatorial experiments, and indeed still has much to learn.